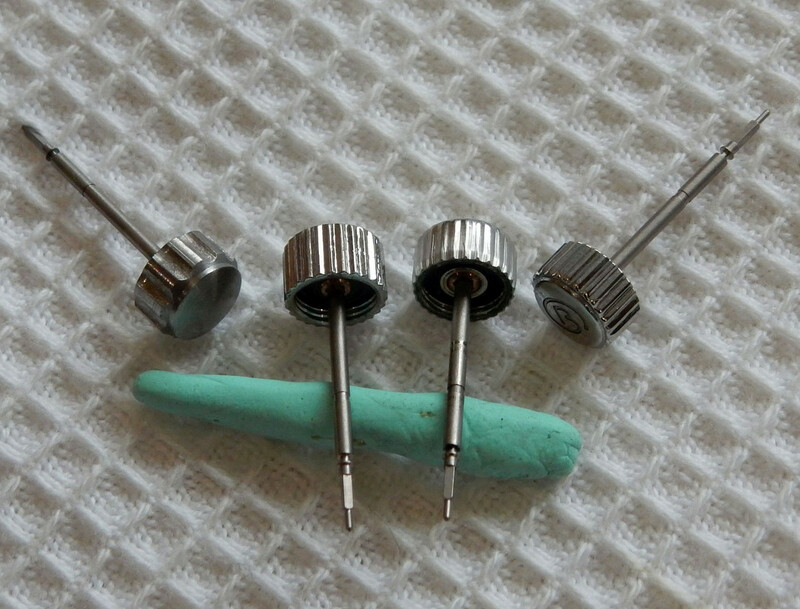 How to remove the chrome "skin" from a Vostok crown. How I added a little colour to the brass. Firstly, If I recall correctly, it was onastar who first mentioned the process, so the credit is due to him entirely. That said, this is how I do it. Here are the four crowns, commonly available. It is the third one from the left that we are dealing with. 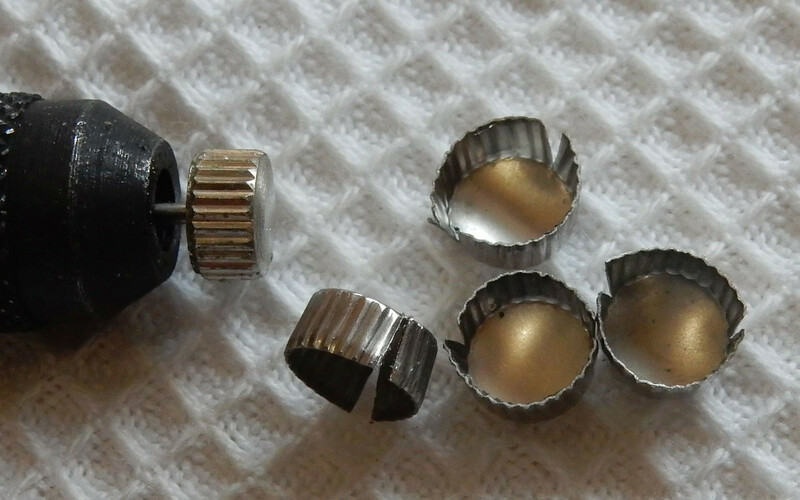 On the right hand one in this pic, you can see that the chrome skin is crimped over the back of the crown. 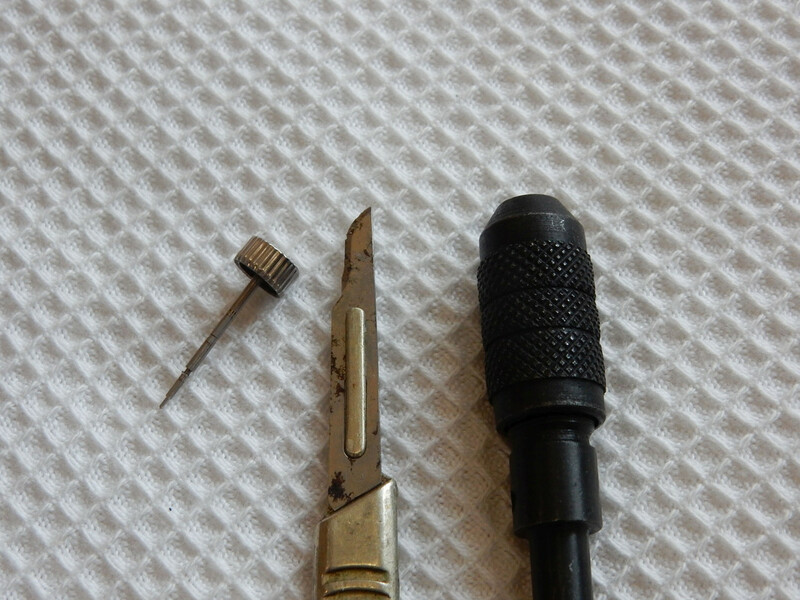 It is a five minute job to remove it, using a craft knife, or a scaple, etc. I use a pin vice to hold the stem. The crown will still rotate of course, but I find it easier to hold. 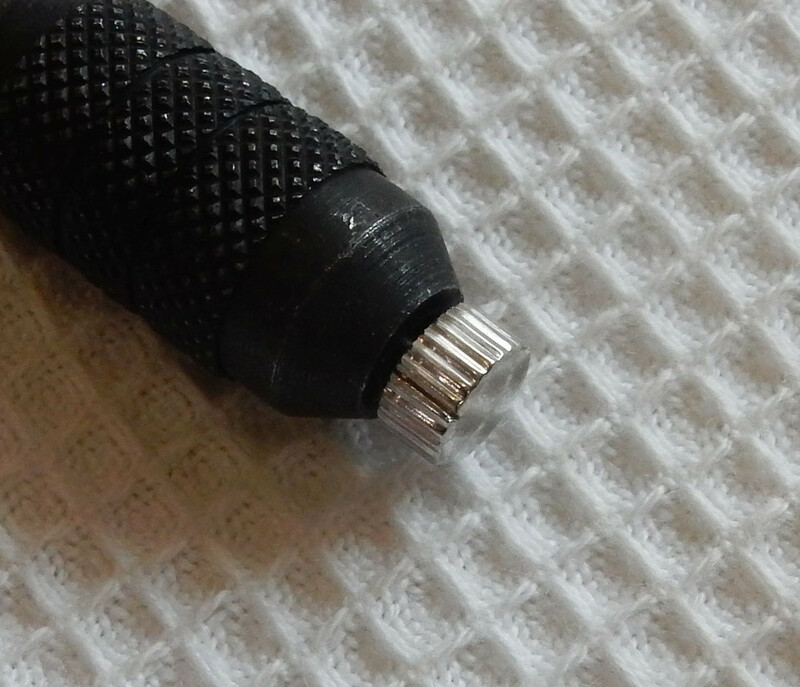 Pinching the crown to prevent it turning, use the blade to score through the plated skin in one of the knurl grooves. Depending on how sharp your blade is, six to ten scores with cut through it. 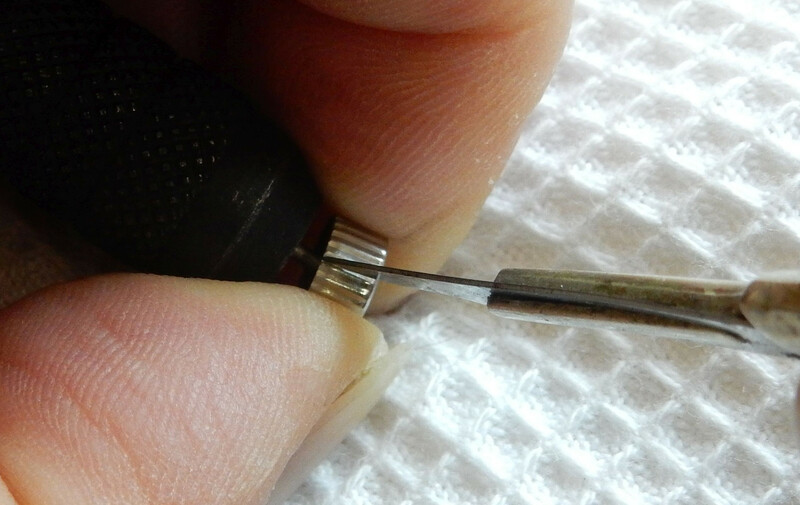 Repeat the process on the opposite side of the crown. The edge will now lift up, with a little help from the point of the blade. Do the same on the opposite side, and the skin will pull off, as here, along with some others. The crown that you now have is brass, which a little hand buffing will expose. 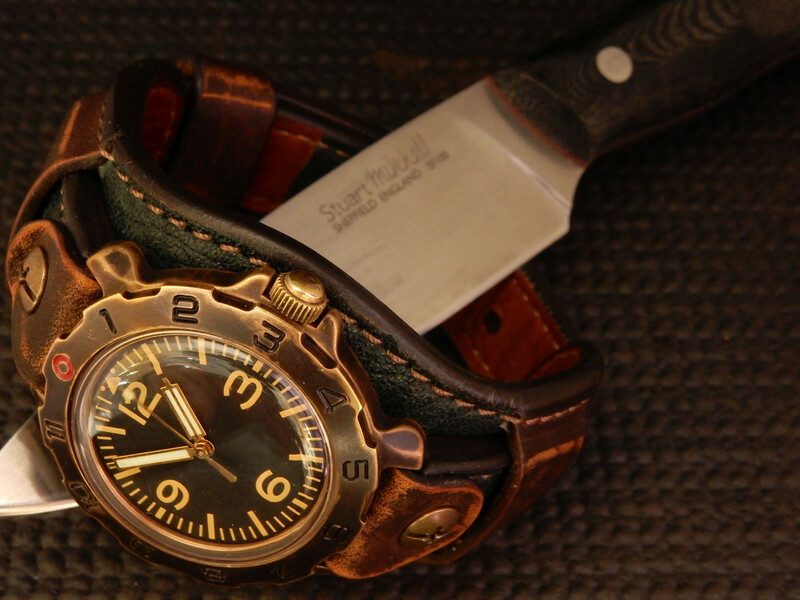 Should you wish to add a little "patina", this is what I do. You will need Gun Blue, de-greaser, and a cotton bud. Clean the crown with de-greaser, using a cotton bud, then apply the bluing solution with a clean bud. Colour will deepen as more coats are applied. This is with two coats. 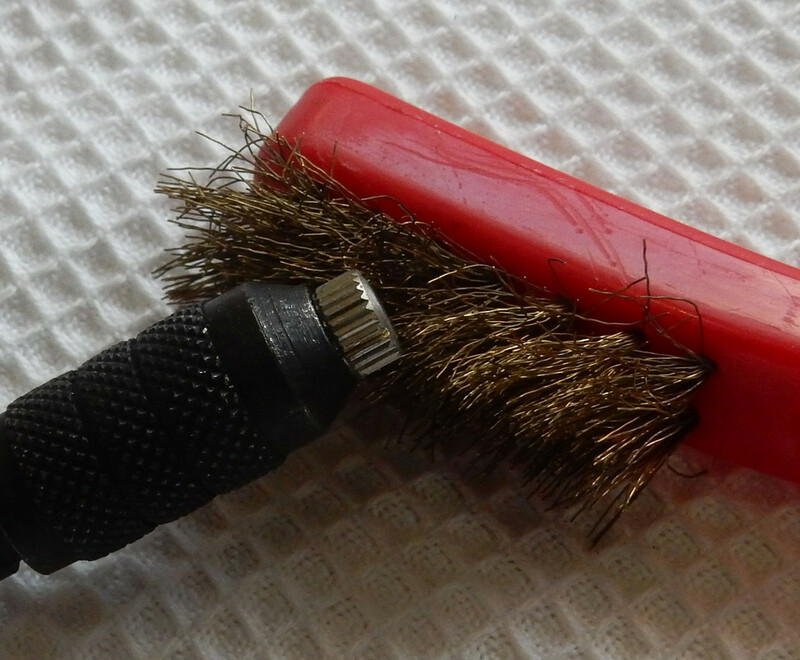 Buffing, or general usage, will expose the brass on the highpoints. It is the same process that I used on this. vvalera, Slm643, Matt_Bored_O and 4 others like this. Anyone know what would be the cause of an hour hand being behind on a 2416 movement? After about one month, the hour hand is 30 minutes behind. The watch is keeping accurate time, however, when the minute hand is exactly at 12:00 the hour hand is between 11:00 and 12:00. I've checked the hand and it isn't loose or making contact with anything and already re-aligned the hands last month. Did you perform any work on the movement apart from installing the hands? 1. Dial Washer: if you removed the dial, the dial washer may have been lost. This could cause the Hour Wheel to occasionally lift up and skip a few teeth, which would make it out of sync with the Minute Wheel. - When you installed the hands did you exert pressure on the side of the Hour Hand to align it after it was fully pressed onto the Hour Wheel pipe? 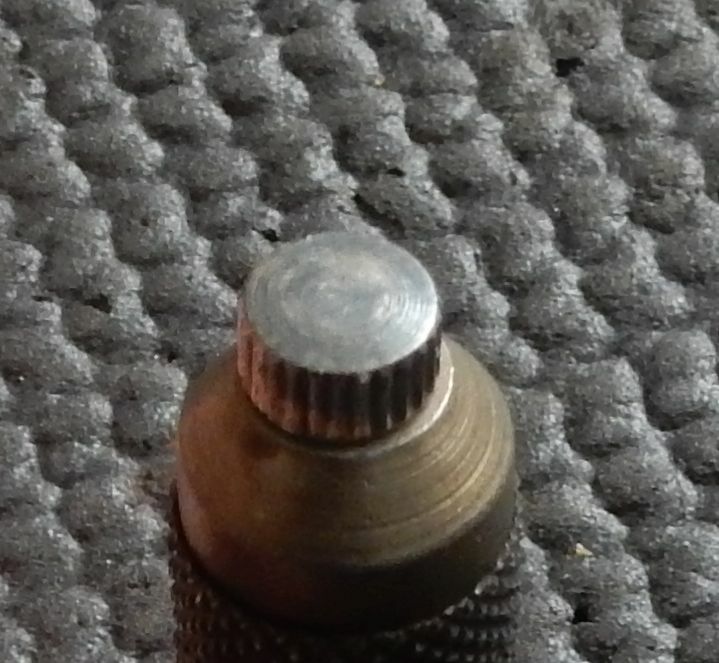 If so, this could have damaged the Hour Wheel teeth or caused it to skip a few teeth, causing it to be out of sync. with the Minute Wheel. Hi there been following for a while. I am wondering where I can get some blue hands, not the stock type. Possibly sword, pencil or merc. I'll have to open the watch up to inspect the hour wheel and check if the washer is missing...waiting for some parts for a case swap and I'll check then. I have a feeling that it's either damaged or missing the washer rather than just being out of sync. The problem gets progressively worse over time. Edit: Another observation about all Vostok movements with a date mechanism. It seems that at the instant the date changes over, the hour hand jumps forward by about 5 minutes. How does the movement compensate for this? Last edited by 24h; January 14th, 2019 at 01:07. Last edited by Matt_Bored_O; January 15th, 2019 at 23:40.
cyberwarhol and VWatchie like this. ....all Vostok movements with a date mechanism. 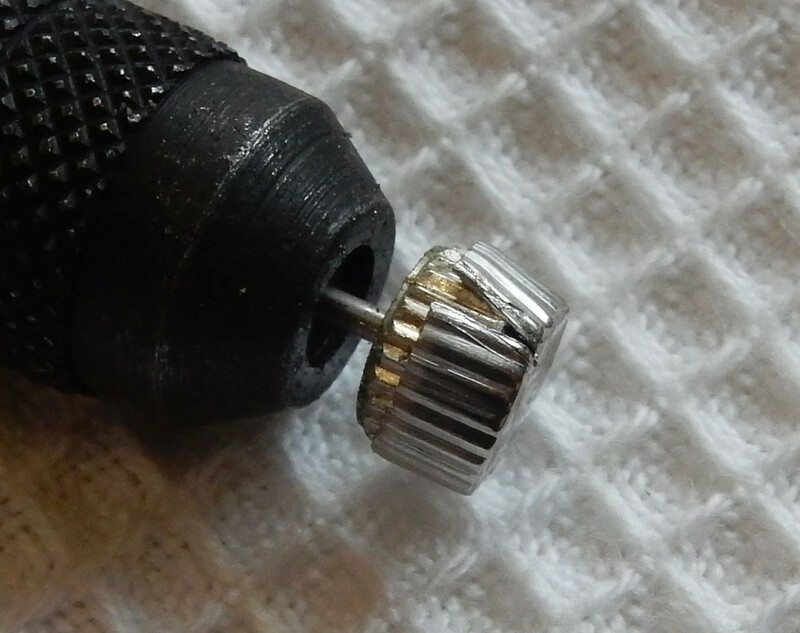 It is most likely the effect of the less than perfect tolerances in the entire gear train. The release of the pressure that is built during the impending date change may be causing the gears or wheels to shift a small amount. 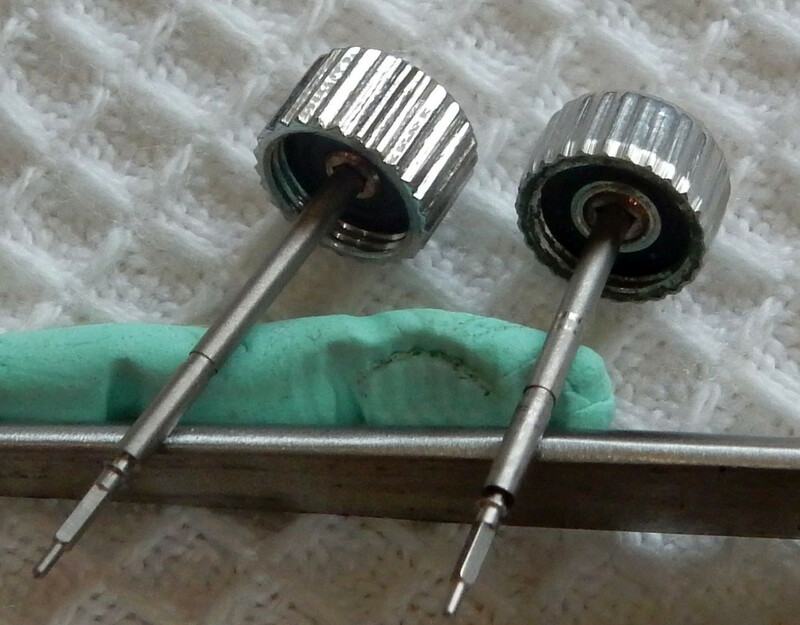 The teeth of each gear or wheel remain in contact. 5 min. is not actually gained, it only appears so. Last edited by Matt_Bored_O; January 18th, 2019 at 02:15. 24h, NOTSHARP and VWatchie like this. 1. Ebay Sellers: if no coloured hands are listed, they may be out of stock. Check again later. 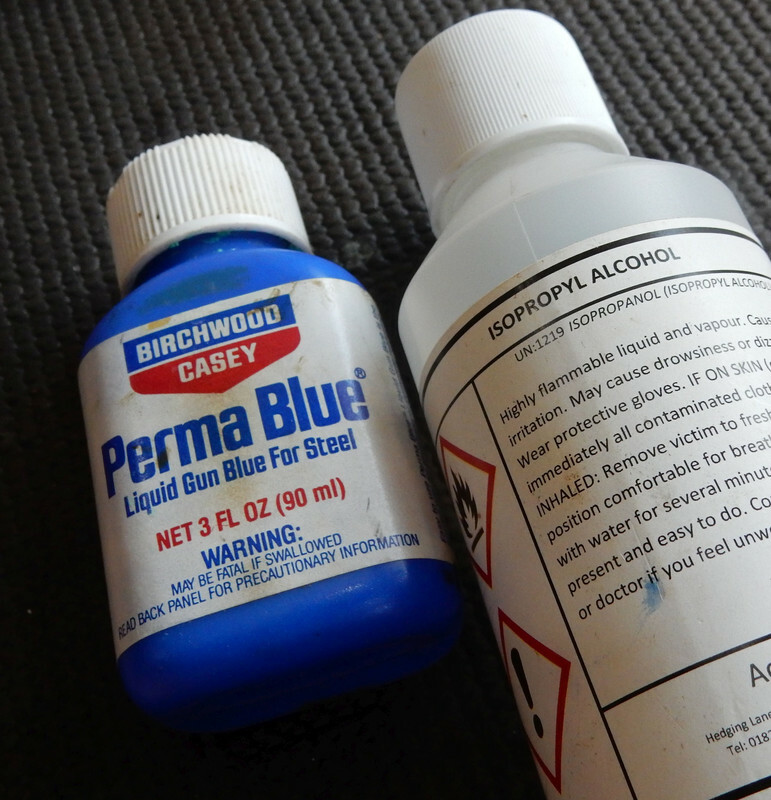 * if the 'blued' hands are not listed: they may be out of stock. Last edited by Matt_Bored_O; January 20th, 2019 at 07:12. VWatchie, Sullivanjt and igorIV like this. Well done Matt! New to Vostok and this thread is a life saver! Matt_Bored_O and igorIV like this. Indeed, no time is gained whatsoever, and this "jump" only affects the hour hand. It's very visible in the below 20 seconds long video that I recorded after having replaced the calendar cam spring on a Vostok 2414. My idea of this is that when the energy in the calendar cam spring is released, some of the energy (due to "less than perfect tolerances", as Matt_Bored_O explains) travels to the hour wheel through the calendar wheel and the intermediate calendar wheel and this is what causes the "jump". BTW, the parts nomenclature that I use comes from this post. 24h and Matt_Bored_O like this.